After the paid-for section of the column/blog ended, I wandered off to other things. At a business conference a few months later, I was inspired to restart the blog as part of a writer’s platform. The webpage and other geegaws failed to materialize, but I stayed with the blog. I honestly cannot tell you why I have continued this long. Outside of the blog, I only write when I get paid. The first nine installments appeared as a monthly commission for the US Eventing Association’s website. I wrote about my new horse and our goal of getting back into eventing. Then, a change in editorial emphasis left my column as a heap of electrons on the digital cutting room floor. Meanwhile, I have grown intrigued by the challenges of documenting a process without a known endpoint. As an adventure in writing, I will continue by self, without benefit of market. In 22 years of equestrian journalism, writing has meant interviewing experts and arranging their opinions. It’s time to see if I have anything to say in my own right. The story is simple. I have a fantastic horse. I can’t ride him. The reasons behind the story are myriad. Is this the slow beginning to a beautiful friendship or a classic amateur mistake of buying too much horse? My answer changes daily. Horse and Rider both have the physical skills required to show tomorrow. The problem lies between the collective ears. I’ll talk about his mindset at a later date, perhaps when I have a better handle on the subject. My issues form a layer cake of dysfunction. My most obvious problem is simple nerves. Hyped up on a high-energy feed, Rodney shook me off a while back [see January column]. The feed problem has been corrected but the memory lingers. Counter to expectation, when he gets tense, I don’t have flashbacks to the fall. Instead, I channel the numerous near-misses when he would spook, jump, spin or perform an exciting mixture of all three. Even though I didn’t come off, the fits he pitched were mindbendingly irrational, athletic, and sudden. The sense I had of impending doom is what knots my stomach. By the time I was actually airborne, I was too busy bouncing and grunting to fret. Before the rodeo act, I had what I’ll call the Ferrari Complex. I deliberately found a quality horse to step up to a new level. When I sit on his back, however, I wonder who I am kidding. My rides are accompanied by a litany of voices in my head telling me that I have no business driving a Ferrari. Even if I were to become sane overnight, my body requires retraining. As I’ve said elsewhere, I had Previous Horse for 20 years. That’s the majority of my adult riding life on the same horse. 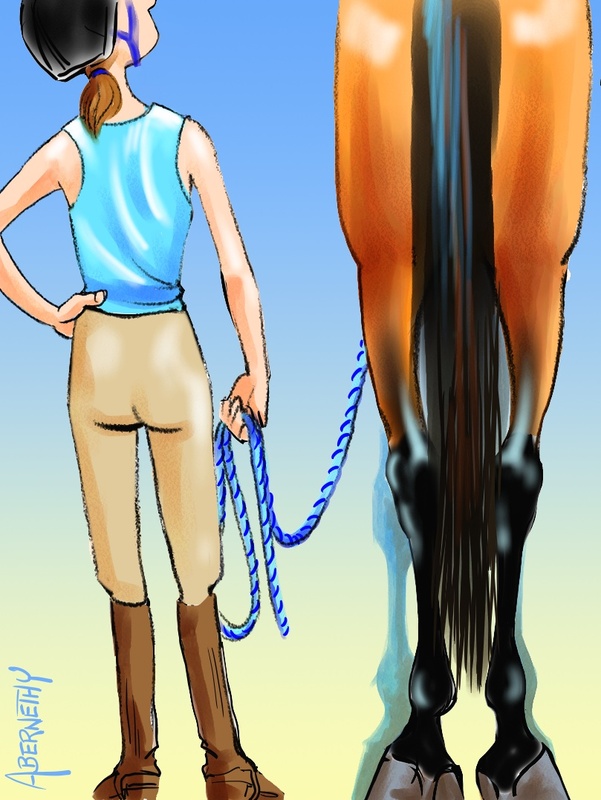 All those tiny, automatic muscles that keep a rider centered above her horse are set to one pattern. Previous Horse was an ill-tempered, barely 16-hand Thoroughbred who moved like a collection of rusty sewing machine parts. Rodney is willing and 17+ hands, 15 of which are leg. He tacks like a stilt walker in a high wind. I get thrown back to front and side to side. While my mind knows that a lovely way of going = high dressage scores, my muscle-memory signals an ongoing state of imminent collapse. The final layer lurks down where reason ends. I think that I am angry at Rodney for not being Previous Horse. There’s no solution but work and time. So, I need patience. And I need it now. P.S. Links to back columns on Facebook at Rodney aka Perpetual Motion. I love your blog. I read every post, so I’m glad you’re going to continue. I’m also selfish and part of my reason for sticking with you is because after riding the same horse for 23 years I too, came into a new horse at a similar (ahem) age. She also tossed me on my keester on first ride at home. Then she tossed me a second time 3 months later. We continued to have numerous zigs, zags and close calls. Over the course of the next two years I rode her, but I often questioned the sanity of buying a young, green (Arab, mare) at this age and stage of my life. Who was I kidding? Being the back yard sort, I didn’t have many options; it was ride and get over myself or sell the horse; which I absolutely could not, would not do. I explored various options, including signing up for lessons on a trainer’s string of horses. To nail my basics, I rode some very schooled horses. Then, under the watchful eye of the trainer and in a “safer” environment, I rode some horses very similar to my own. I did fine. I did better than fine. On those days I’d go home and ride my own horse with an abundance of confidence. I learned to recalibrate my trepidation and we made some good progress. Eventually, I boarded my horse with said trainer for several months, which helped us put a lot more of the pieces of the puzzle together. I’m not really sure how my trepidation began. Was it the fall? Probably not, as I’ve fallen before. And my horse can still toss me if she wishes, no doubt about that. But now she’ll have to get up a LOT earlier in the day if she wants to try! Long story short (not), after reading your saga from the start and applauding every step of the way, I can’t help but wonder if the whole riding “other” horses didn’t start as a confidence booster, but end up as a distraction? We don’t learn how to sail by taking up kayaking. If you want to do eventing, then get thyself to an eventing barn or trainer and start riding your way up the ladder there. Yes, it takes a lot of humility, but I honestly think the only way you’re going to build the confidence to do what really want to do with the horse(es) you have, is to do it with horses that do that (or something similar) now. If I own a barrel racer who is better, faster, far more athletic than I bargained for, then I would do well to start riding entry level barrel horses (again) and build up to what I’ve got from there. Riding Western Pleasure horses isn’t going to give me the same experience and confidence that I’m going to need to compete on my own horse in my sport of choice. I say this with the best of intentions and can only hope this makes a little sense. *shrug* Or maybe I’m full of crap? I dunno. I’d just like to see things work out for you and your horses! You’ve put a lot of time, energy and thought into this. Hmm. This looks important. Better put it aside until I have time to read it properly … tick, tick, tick … I’ll make up for the lag with a profound and witty comment in response … tick, tick, tick … It’s too late now … tick, tick, tick … head, sand, metaphorical ostrich … tick, tick, tick … No, that’s not polite. I better go back … tick, tick, tick … thus passes the better part of four months. I hear you. If I lived in the Northeast, I’d be on it in a heartbeat. Don’t touch that dial. Change is in the air. A big push, then re-evaluation. More on this shortly, i.e. Sept 1st. Glad you revisited this! When it comes to getting help with your horse I don’t think it so much matters what your person’s specialty is. What matters is that they are safe and the right choice for your team. You’ll have plenty of time to refine and/or specialize later if you desire. Forward is good!